Image courtesy of Seth Tisue. Licensed under CC BY SA 2.0. 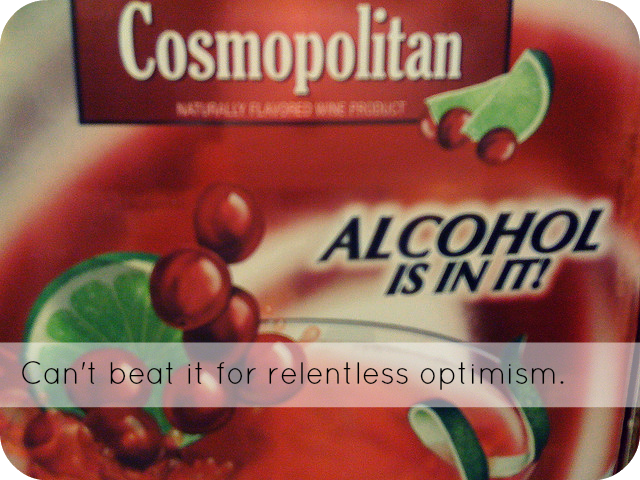 The alcohol industry is a particularly fertile stomping grounds for this kind of weird, relentlessly-cheerful copy. After all, there are only so many ways to say, “This will get you drunk, which you enjoy!” that still involve you being coy enough about it that the consumer doesn’t feel like they have A Problem. Until this weekend, my favorite version of this was the Daily’s Cocktails pouch copy. For those of you who spent less of the last few years in college town liquor stores than I did, Daily’s pouches are basically Capri Suns for adults. They contain a mix of sugary-sweet cocktail mixer and malt liquor, flavored like any number of beverages that one might conceivably order at a bachelorette party. You pop them in the freezer and then enjoy them in a hazy cloud of self-loathing/beach vacationing. They are reviewed, wonderfully, in this ChowHound article. Which, true, is the selling point of the product. But something about that perfect cheerfulness and that missing definite article at the front just undoes me. This weekend, to supplement my time on the beach in Savannah, I went with the also-ran pouched alcohol concept: Seagram’s Escapes. Of course, given Daily’s early lead in the market, the Seagram’s people can’t go with the blunt delight of “Alcohol is in it!” So they gave up..
“Contains alcohol!” chirps the Segram’s pouch, containing anything from a Jamaican Me Crazy to a Blue Hawaiian. This copy is hysterical to me. Someone, somewhere along the line, was set with coming up with a phrase that conveyed–but was not–”Alcohol is in it!”–and decided that this was the best that they could do. Their work on this godforsaken pouched alcohol project was done. Besides, they had to focus on the important safety warning for the back. “Do not microwave!” didn’t write itself. I just want you to know that yessssss.